L-Theanine for Dogs - Uses / Dosage / Side Effects - Vet approved! is a type of anxiety disorder. The cornerstone to treating any anxiety disorder is a form of “doggy therapy” called behavior modification, but most dogs also benefit from the help of supplements and medications that help alter the fear pathways in their brain chemistry as well. One of the most effective supplements for this purpose is called L-Theanine. Discovered as an amino acid relatively unique to green tea leaves in the 1940s, L-theanine became a staple in the Japanese diet in the 1960s for the purpose of promoting focused relaxation. It holds “generally regarded as safe” status in the USA, and is a permitted for use in nearly every country that allows supplements to be distributed. While there are approximately 20mg of L-theanine found naturally in green tea leaves, supplements use a synthetic version of the amino acid in amounts as high as 200mg in commercial products. The most widely recognized brand of synthetic L-theanine is called Suntheanine. Since the quality of ingredients can vary greatly from one brand of supplement to the other, Suntheanine is the only source of synthetic L-theanine I recommend. The exact mechanism L-theanine uses to exert its calming effects on the brain are still unknown, however, the neurotransmitter GABA appears to play a large role in its actions. GABA is the main inhibitory neurotransmitter in the brain, meaning its job is to decrease reactivity and slow down message transit, both of which contribute to a decreased state of anxiety and arousal. An even more compelling effect of L-theanine on the brain is an increase in alpha waves, the waves characteristic of a calm, focused mental state, such as those recorded during meditation exercises. This unique brain waveform is not commonly seen in pets or people medicated with traditional anxiety medications such as Xanax or Klonopin, both of which cause drowsiness. It is likely this characteristic that gives L-theanine users the unique feeling of being calm but not tired or dopey. Suntheanine side effects have not yet been reported officially in dogs and cats. In humans, there have been reports of headaches, low blood pressure, and changes in thought patterns. The only known risk of using theanine for dogs with anxiety is that it may not work. < 10 lbs: use Anxitane-S as directed. There is no human product small enough. 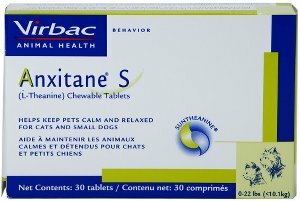 Anxitane-M&L for medium and large dogs. The labeled dose of Anxitane for dogs is 1 – 10 mg per pound. See calculator above! over the counter. Many chewable tablets contain xylitol, a sugar substitute that is toxic to dogs. Stick to capsules of Suntheanine-branded products for assurance of safety and quality. Did we miss something? Please let us know in the comments. is Anxitane a prescription drug? Hi Dan! Anxitane (Suntheanine) (L-Theanine) is not a prescription drug. It is actually a neutraceutical that exerts a calming and relaxing effect in cats and dogs that exhibit nervousness or anxiety. Thank you, Dr. Cabriles. And, I apologize for this late response. I rarely get on Disqus so I was surprised by your advice. But, again, thank you. Thank you! I appreciate your input. It’s so rare…lol. What about its effectiveness in asthma/bronchitis/maybe even pneumonla/fluid in lungs capacity and dosages?